A very unique looking clock that does not require any batteries! The water powered bottle clock is exactly what the title suggests. It is a clock in a bottle that is powered by water. The transparent bottle allows you to see the electrode plates inside. The electrode plates harnass energy from the water. 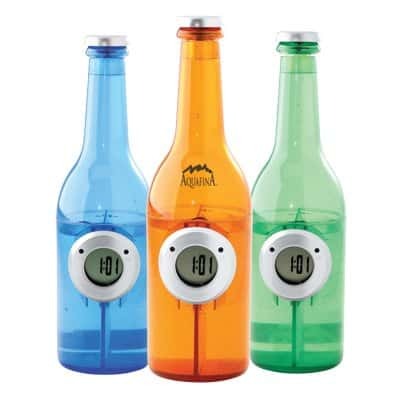 All you need to do to keep the clock running is to fill the bottle with water. The pop off cap is simple to remove and replace anytime you need to fill it. Environmentally friendly and it looks really cool! This clock is anything but boring! A wonderful gift idea or a fantastic display piece for the home or office. The water gives a fresh natural appeal that is perfect for seaside homes. The cool technology makes it a great choice for modern inner city decor as well. Clocks have really become an art form. If you are a music lover you might like to take a look at the Original Music Note Clock.